Hey DOG & CAT LOVERS! Wow - is this the game for you!! 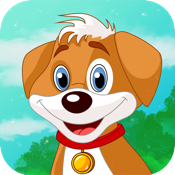 Awesome super fast fun puzzle game that you just won't want to put down - well unless of course you need to walk your real dog or feed your real cat! See how many cats & dogs you can help free by tapping on two or more identically colored ones that are either next to each other or above or below each other. When you do that your pets will be free and blow HEARTS to you for a job well done! Each level has a set number of pets (points) that you need to help escape in order to get to the next exciting level. This is a fast action game but you will need to think carefully to get the right strategy going so you can free as many pets as possible. The ultimate goal is to clear the screen completely! 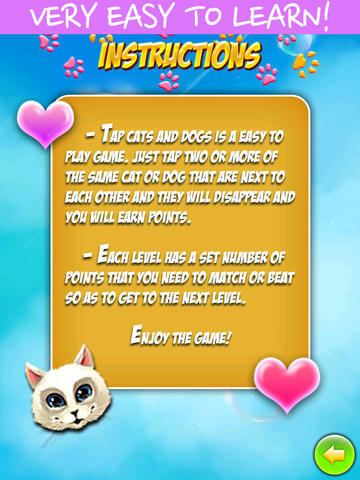 ** Game Center to see if you are TOP DOG or TOP CAT!